Celebrate the festive season with a dish that’s popular everywhere in India by taking up the health quotient – Sathumaavu Dahi Papdi Chaat! 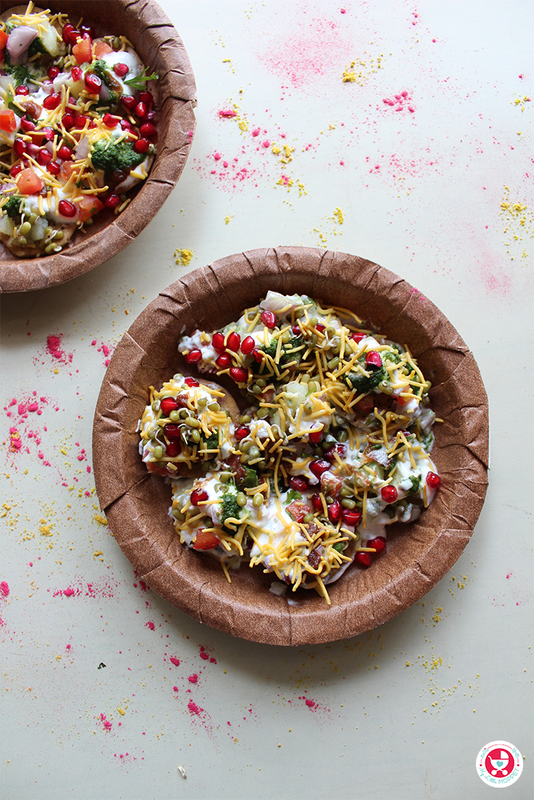 Dahi Papdi Chaat is a lip- smacking street food of North India. Basically in this dish, deep fried refined flour papdi are topped with boiled potatoes, chickpeas, seasoned curd along with spicy green chutney and sweet and sour tamarind chutney. To make it a healthy affair, here I have made the papdi using My Little Moppet’s Sathumaavu flour and baked it instead of deep frying. 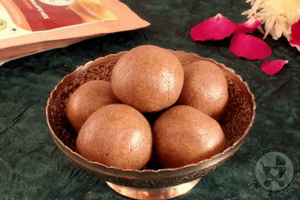 So what you get is a completely healthy, guilt-free snack that is perfect for Holi! 1. 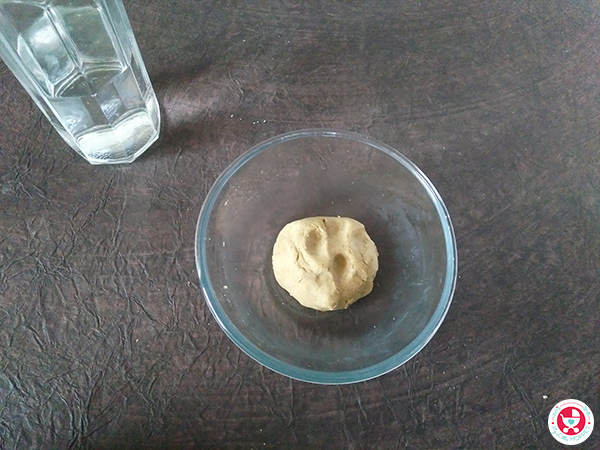 Take whole wheat flour, My Little Moppet Sathumaavu powder in a mixing bowl. Add black pepper powder, salt and oil to it. 2. 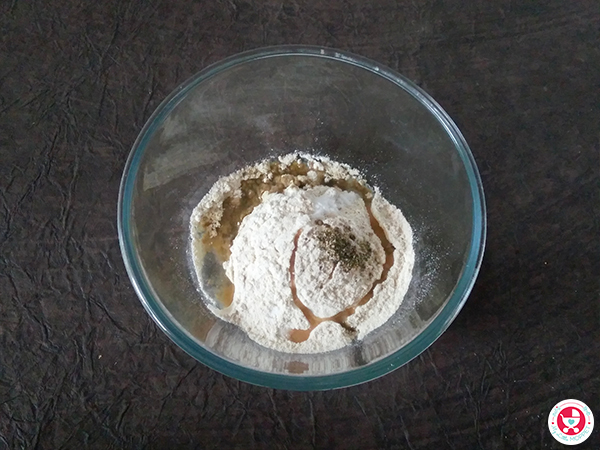 Mix everything well and knead the flour into a semi soft dough using water as required. 3. Cover and keep the dough aside for 15 minutes. 4. Meanwhile, preheat the oven at 180 degrees Celsius for 15 minutes. 5. Divide the dough into 2 -3 portions and roll out each portion individually on a working platform to a sheet of 1/4-inch thickness. 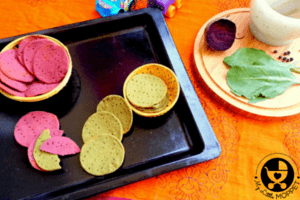 Cut out round shaped discs using a cookie cutter or round lid. Make impressions with fork all over so that the crackers do not puff while baking. 6. Arrange the discs on a baking sheet in a single layer. 7. Bake at 180 degrees Celsius for 15 minutes. Allow the crackers to cool down on a wire rack before transferring them to an airtight container. Make all the crackers similarly. I could make 2 dozen crackers using the above quantity of ingredients. 1. Whisk the curd with a wire whisker until it is creamy. You may add little chaat masala or salt and sugar to the curd if you wish. I have kept it plain. 2. Keep the mashed boiled potato sprinkled with salt and black pepper ready in a bowl. 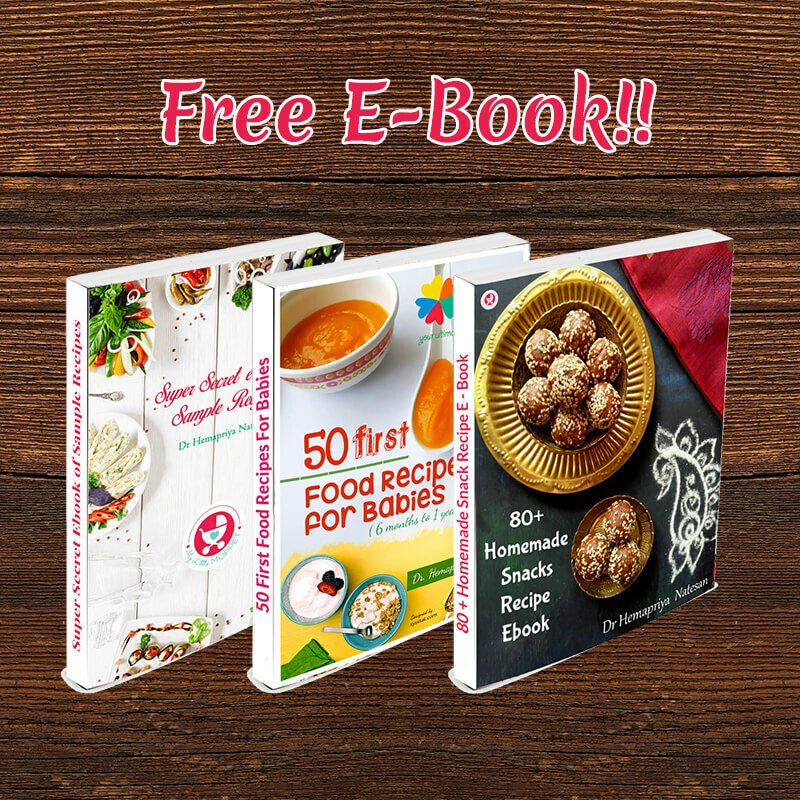 Similarly keep both the chutneys, steamed sprouted mung beans, pomegranate seeds, sev, handy in bowls. Mix chopped onion, tomato and cilantro in a bowl and season it with little salt. 3. 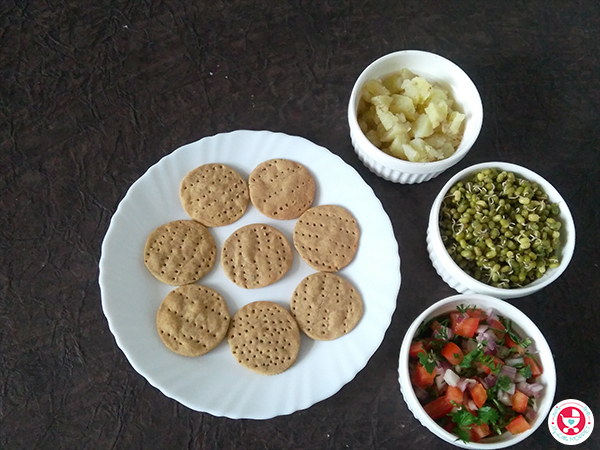 Take 2 serving plates and arrange 7 baked Sathumaavu crackers/ papdi on each plate. 4. Now add a teaspoon of seasoned and mashed boiled potato on each papdi. 5. Next add 1 teaspoon of steamed mung bean sprouts over each papdi followed by 1 teaspoon of onion tomato coriander mix. 6. Now add 1-2 teaspoon of whisked curd to each papdi. Top it with both chutneys as per taste. 7. 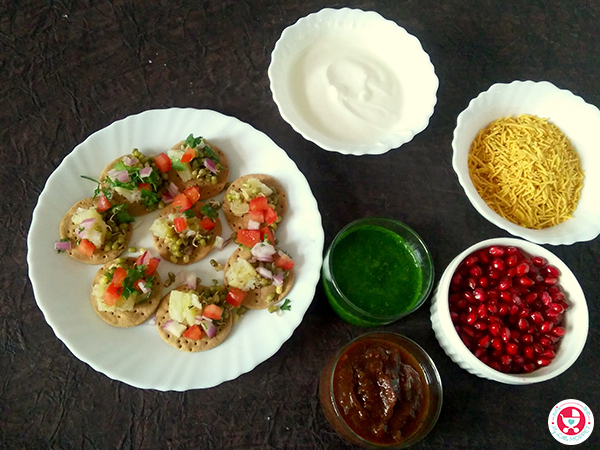 Finally add sev if using and pomegranate arils and serve the delicious and healthy sathumaavu dahi papdi chaat immediately. 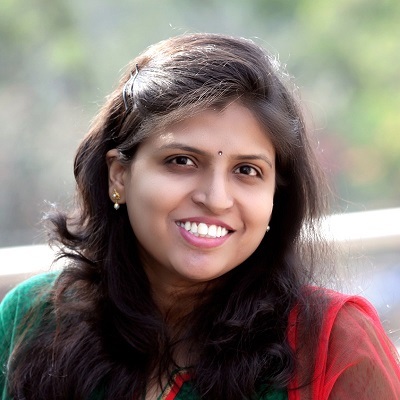 To make the green chutney at home, add a small bunch of fresh coriander leaves, roughly chopped to a grinder jar with 1/2 cup washed mint leaves, 1-2 green chilies, black salt, juice of 1 lemon, 1/2-inch ginger piece. Add little water if required to make a fine chutney. For dates and tamarind chutney, soak a gooseberry size tamarind in hot water and later extract the pulp. Boil the seedless chopped dates in water until the date is soft and mushy. Run it through the grinder jar. 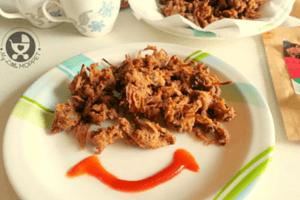 Mix the dates puree and tamarind pulp and cook it until it reduces to a chutney consistency. Season it with black salt, red chili powder and jaggery powder and boil again. Use on cooling. 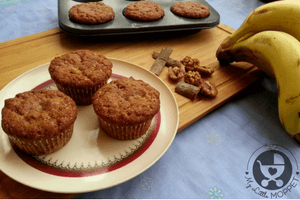 Transfer the remaining into an air tight container and refrigerate until use. 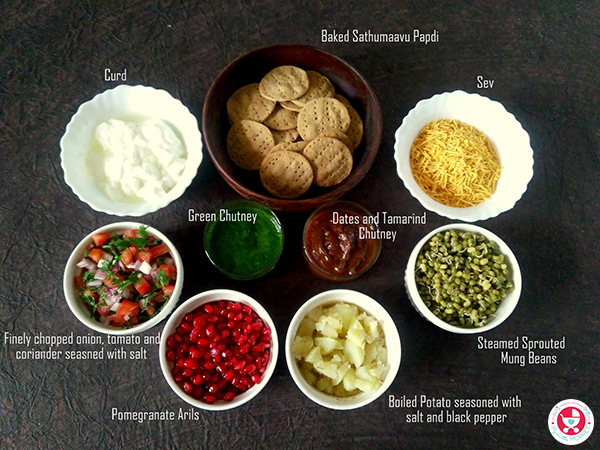 You may add boiled chickpeas as well to this chaat. 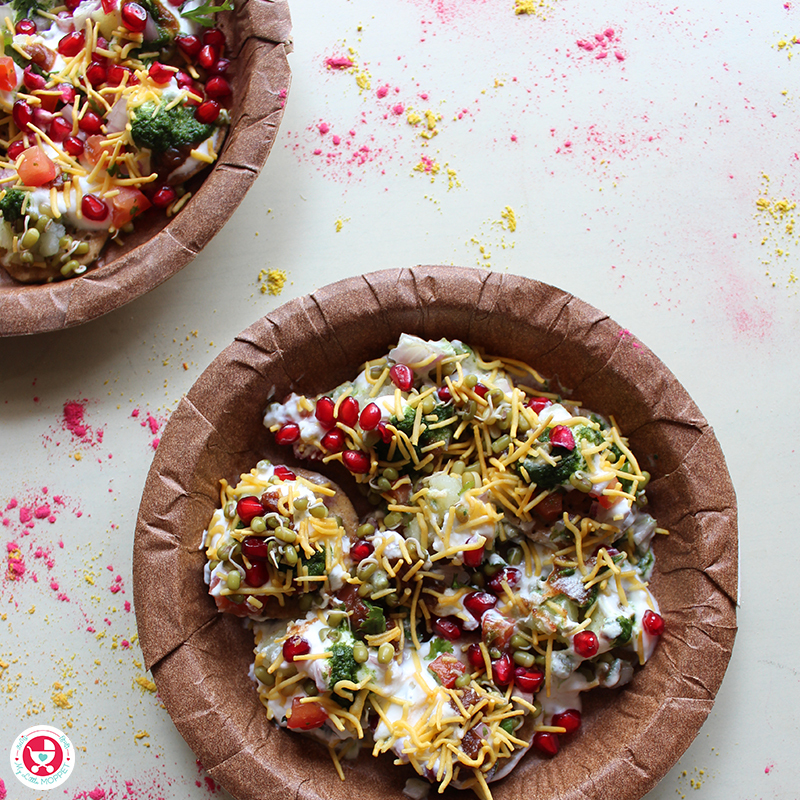 You may sprinkle chaat masala on the dahi papdi chaat while serving if you wish to. 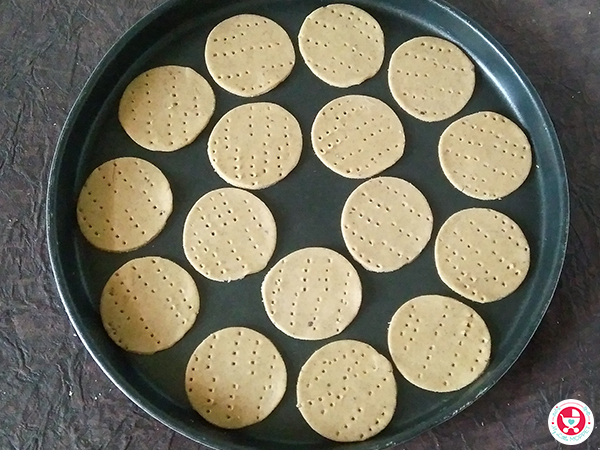 These sathumaavu crackers (Papdi) can be made ahead of time and stay good in air tight container for a week or so. 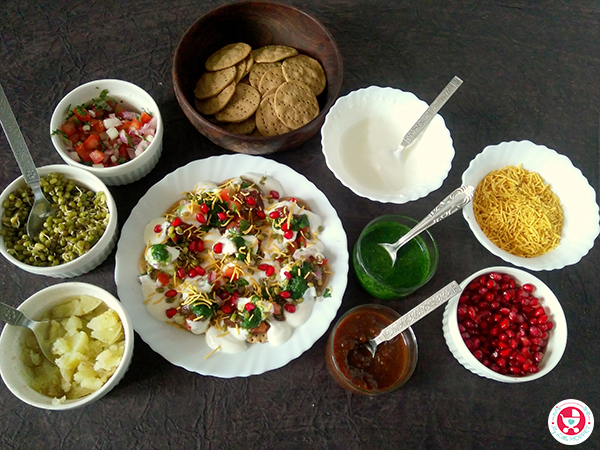 I have used steamed sprouted mung beans and boiled potatoes in this chaat along with homemade curd, chutneys, finely chopped onion, tomato, coriander and pomegranate arils. 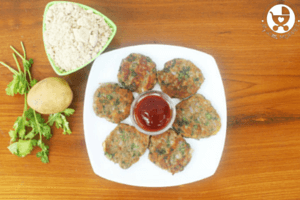 This healthy and colorful chaat is appealing to fussy eaters and lovers of ‘junk food’, although they won’t realize that they’re having something superbly healthy! Sathumaavu Dahi Papdi Chaat is a nutritious chaat variety made with the healthy sathumaavu, which will add more fun, color, taste and heath to diet.  Take whole wheat flour, My Little Moppet Sathumaavu powder in a mixing bowl. Add black pepper powder, salt and oil to it. 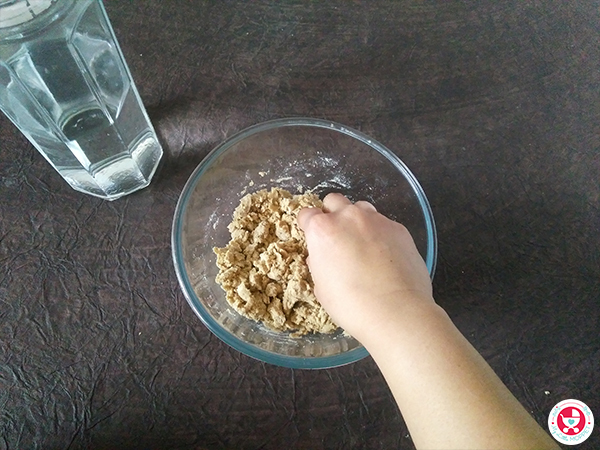 Mix everything well and knead the flour into a semi soft dough using water as required. Cover and keep the dough aside for 15 minutes. Meanwhile, preheat the oven at 180 degrees Celsius for 15 minutes. Divide the dough into 2 -3 portions and roll out each portion individually on a working platform to a sheet of ¼-inch thickness. 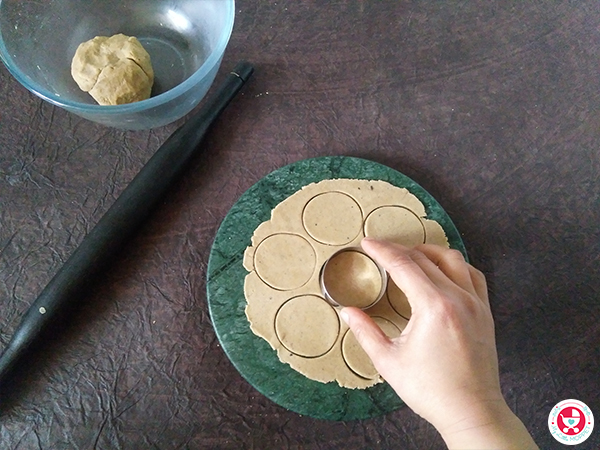 Cut out round shaped discs using a cookie cutter or round lid. 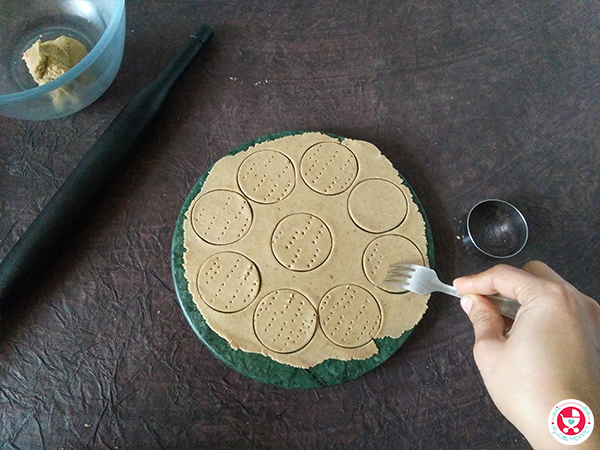 Make impressions with fork all over so that the crackers do not puff while baking. Arrange the discs on a baking sheet in a single layer. Bake at 180 degrees Celsius for 15 minutes. Allow the crackers to cool down on a wire rack before transferring them to an airtight container. Make all the crackers similarly. I could make 2 dozen crackers using the above quantity of ingredients. 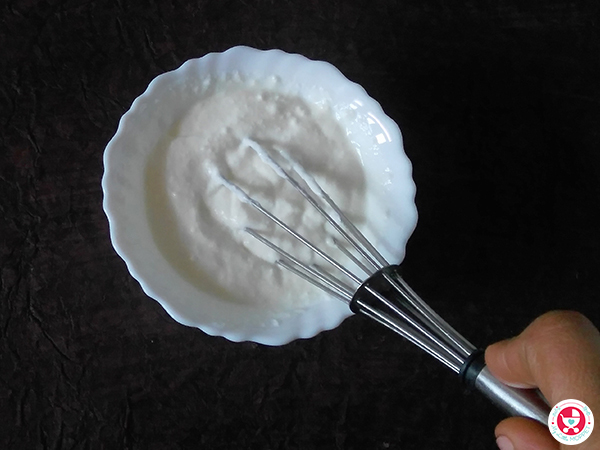 Whisk the curd with a wire whisker until it is creamy. You may add little chaat masala or salt and sugar to the curd if you wish. I have kept it plain. Keep the mashed boiled potato sprinkled with salt and black pepper ready in a bowl. 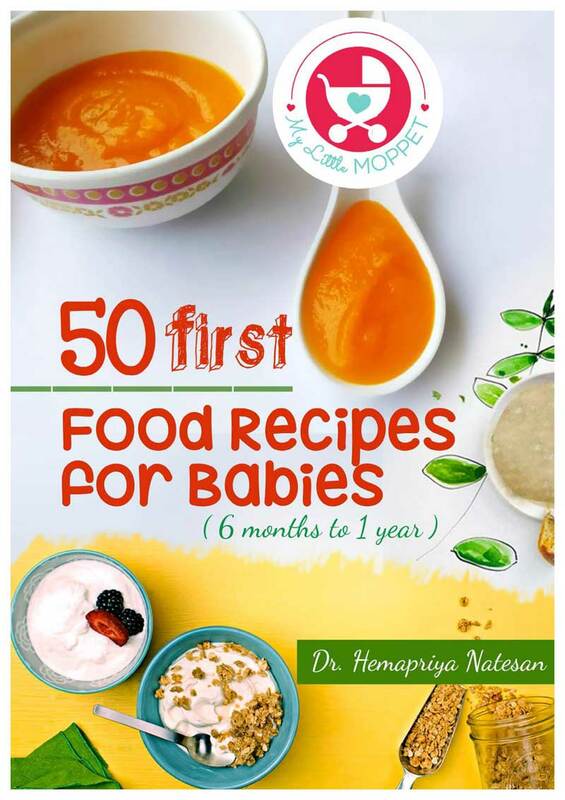 Similarly keep both the chutneys, steamed sprouted mung beans, pomegranate seeds, sev, handy in bowls. Mix chopped onion, tomato and cilantro in a bowl and season it with little salt. 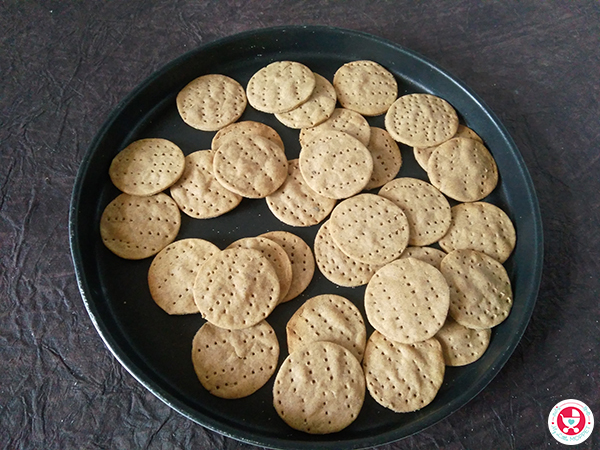 Take 2 serving plates and arrange 7 baked Sathumaavu crackers/ papdi on each plate. Now add a teaspoon of seasoned and mashed boiled potato on each papdi. Next add 1 teaspoon of steamed mung bean sprouts over each papdi followed by 1 teaspoon of onion tomato coriander mix. Now add 1-2 teaspoon of whisked curd to each papdi. Top it with both chutneys as per taste. 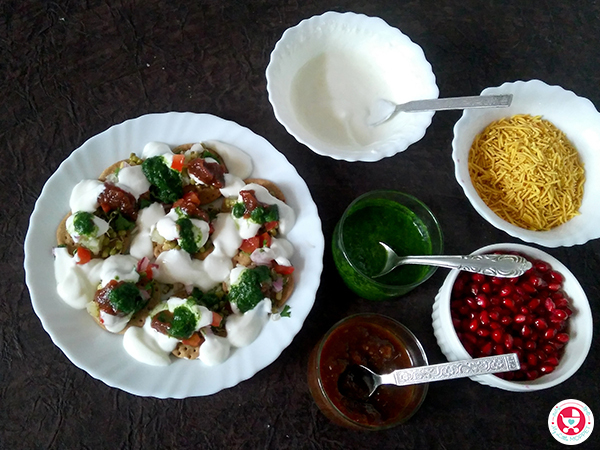 Finally add sev if using and pomegranate arils and serve the delicious and healthy sathumaavu dahi papdi chaat immediately. To make the green chutney at home, add a small bunch of fresh coriander leaves, roughly chopped to a grinder jar with ½ cup washed mint leaves, 1-2 green chilies, black salt, juice of 1 lemon, ½-inch ginger piece. Add little water if required to make a fine chutney. 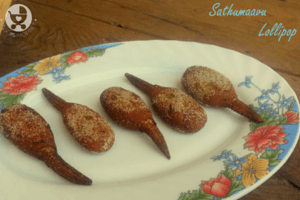 Wondering how to get this Sathumaavu Health Mix? Don’t worry, we’ll send it to you! We prepare it fresh as soon as you place your order and deliver it straight to your doorstep.